This Listing is for 4pc Front & Rear Rubber Floor Mat set. Front mats approximated dimensions are 25.5 x 16.5 inches. Rear Mats Approximate Dimensions 14 x 16.5 inches. Floor mats are made out of high durable Quality rubber material. May be trimmed for a better fit. They are made of long lasting heavy duty rubber material that will protect your vehicle from water, dirt, snow, mud and other debris. They are very easy to clean, just use soap and water. Looks great in all vehicles. Designed with Vibrant colors; which, are molded in colors that will not fade. These Items are a Universal product; therefore, will fit MOST vehicles. Floor mats not only will it protect your vehicle, but customize it to fit your own taste and personality. If you have any questions regarding these listing, please feel free to contact us via email. 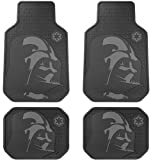 Instantly customize your car, truck, van or SUV with these brand new set of Star Wars movie trilogy series floormats. Universal size fits almost all vehicles. Easy to clean with soap and water and very durable. Protects your vehicle’s carpet from damage. Do not stack floor mats pm top of existing floor mats.